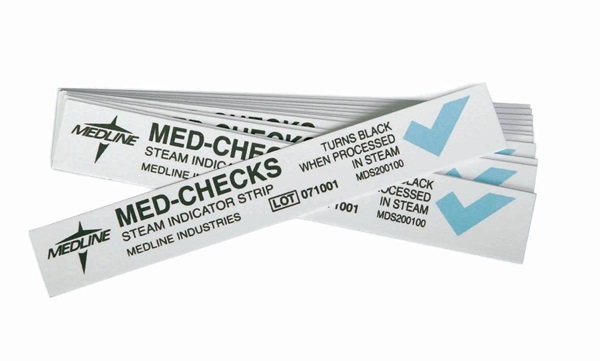 Class 4 steam indicator strip that measures 4"L x 1.25"W x 1.5"H and has a distinctive, non-reversible color change from blue to black. These strips contain latex, and are for use in gravity and vacuum cycles. Sold 250 per box. 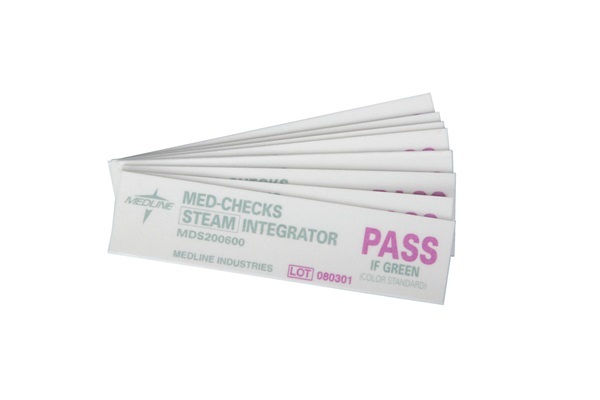 3M Comply class 4 steam indicator strip that measures 0.625"W x 4.25"L in short form, which is convenient for smaller packs. Has a distinctive color change from yellow to black and can be used in all steam sterilizers. These strips are latex-free and are for use as an internal pack monitor for 250-270°F processes. Sold 250 per box. These measure the time, temperature, and presence of steam in steam sterilizers. They use a distinctive color change from purple to green and are made of laminated plastic. Measures 4" in length and are to be used for Cidex OPA tests. Latex-free. Sold 250 per box. 3M Comply class 4 steam indicator strip that measures 0.625"W x 8"L and have a distinctive color change from off-yellow to black. It can be used in all steam sterilizers and is perforated, allowing for full- or half-length use for different pack sizes. 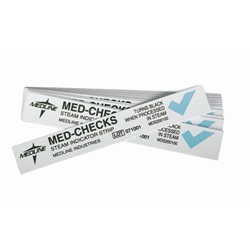 These strips are latex-free and are for use as an internal pack monitor. Store at USP controlled room temperature. Sold 240 per box.